Kevin Hillstrom: MineThatData: What Was The Point Of The Last Two Weeks? What Was The Point Of The Last Two Weeks? Sure, I shared a few thoughts and you may have disagreed with them, but what was the point? The point was to demonstrate that most of us are ultimately in the "SELL" quadrant. We don't have the creative chops of a Duluth Trading Company, we don't have the financial resources to "BUY", and we are never going to "SCALE" and play with the big brands. 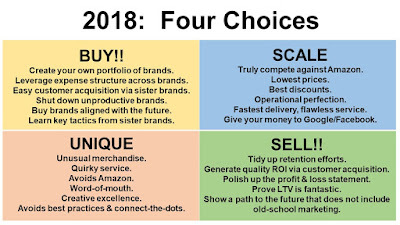 So if we're in the SELL quadrant, we have two choices when we are ready to sell in 2019 or in 2029 or in 2059. We can sell for pennies on the dollar. We can sell to top dollar. Which would you rather sell for? If you had to honestly look at your business today, are you closer to selling for pennies on the dollar or are you closer to selling for top dollar? Too often, I'm contacted by companies who could only sell for pennies on the dollar, or by companies looking to purchase brands for pennies on the dollar. The companies who are worth pennies on the dollar tend to have something in common. They hold on to the past while publicly acting like they are a modern brand. In other words, these companies exhibit the characteristics of a company stuck in 1993. Meetings are about catalogs, not about merchandise. The lobby is littered with catalogs and does not have a digital presence in any way other than the LED television which is showing images of catalogs being created. People care passionately about how the April catalog is performing during the first four hours of the in-home window and do not care about how paid search is performing at all ... "that's what our paid search vendor is paid to do." More than half of new customers are acquired via catalog co-ops, Google, and/or Facebook. The ad-to-sales ratio is > 25%, mostly comprised of paper, printing, and postage. Orders are still being mailed with an order form and a check. Merchandise doesn't sell online unless a catalog is in the mail at the same time. An Executive is obsessed about "competing with Amazon", as if that were something that a < $500,000,000 brand can actually do. There are actual discussions about whether a catalog should be 64 pages or 68 pages, and those discussions last longer than 5 seconds. Employees < age 35 are not trusted. Customers are generally age 60-75, but list vendors say that your target audience is a 35-55 year old suburban woman. Somebody (or Everybody) at an Executive or Director level is constantly telling employees that the brand is an "omnichannel" or "multichannel" brand and left catalog marketing long ago and then holds meetings to talk about how digital marketing channels must support the catalog. The last bullet point is probably most important. I run into it all the time. An Executive will tell you that because there is an email program in place and because the Twitter feed is followed by 2,194 people (only half are bots) that the brand is no longer a catalog brand but instead is a modern omnichannel brand that supports a middle-aged consumer. This is what the past two weeks have been about. 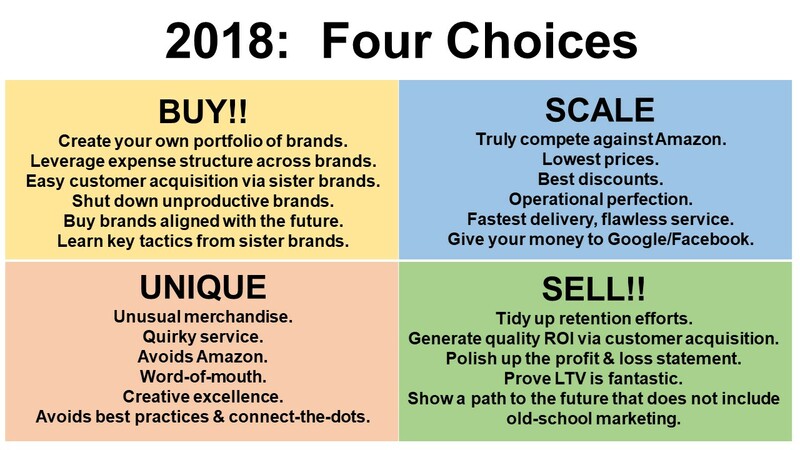 If your brand routinely falls into the bullet points above, you are in the SELL quadrant and you are skewing toward getting pennies on the dollar when you finally decide to SELL. You can improve the profit-and-loss statement by being tactically better, no doubt about it. You can improve the profit-and-loss statement by changing your culture, by recognizing that it is 2018 and it is time to put some of the legacy of 1993 to rest. It's really hard to be tactically better if your culture won't accept the tactics that make you tactically better. That's the point of the past two weeks.